Date of 2003 London-Brighton Commercial Run ? : On May 4th. SVVS Hon. Tres. Tony Russell needs for book any info, anecdotes, pictures adverts etc in connection with L.M. 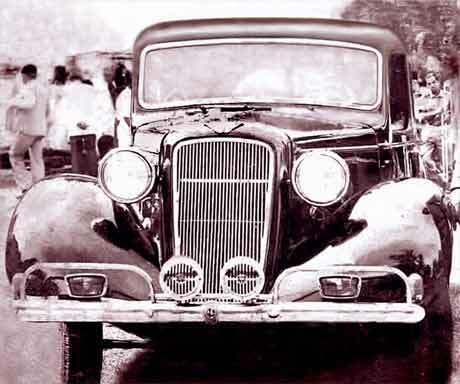 Ballamy who was an engineer and designer of split beam axles, most notably for the Ford Pop. Photo received from Judy Hall of Dorking (UK) trying to get more info about her grandfather seen driving the car. We were able to confirm that the car is a cca 1906 Wolsey Siddely registered in Middlesex. Wolseley-Siddeleys were only made between 1904 and 1910. There is no trace of this car in any of the registers nor any specific historic trace of this car. We suggested Gaydon Motor Museum and other avenues. Photo from Barrie Trotter of Waihi College (New Zealand) asking for assistance in identifying the car in the photo. Photo was printed on parchment type paper which doesn't magnify well. It was taken in Christchurch, NZ, and identifying the car would assist in identifying the people. 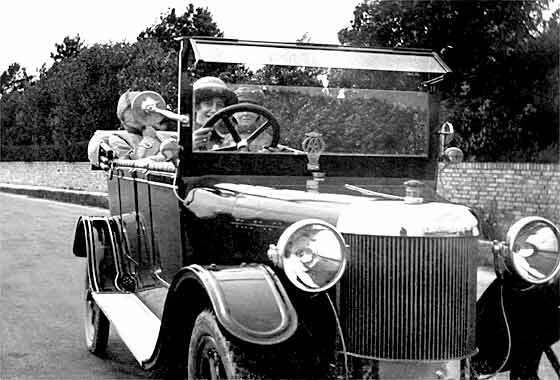 The bonnet design strongly suggests a Renault of 1910/11 vintage, either a 10CV or 12CV. Any advice would be much appreciated. Photo received from Roger Jones (Holland) asking us to identify a car in which his ancestors were sitting. The photo was taken in Bath, in Somerset. 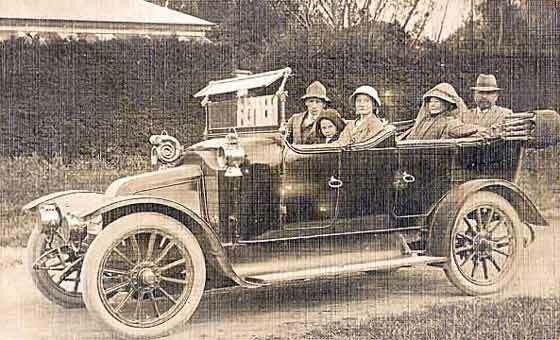 His great-grandfather, in the front passenger seat, died in 1917, so it must have been taken prior to that. The problem is the photo does not show the complete car or the important bonnet. On present info we feel the car is American and possibly a 1911/12 Haynes. HELP ! 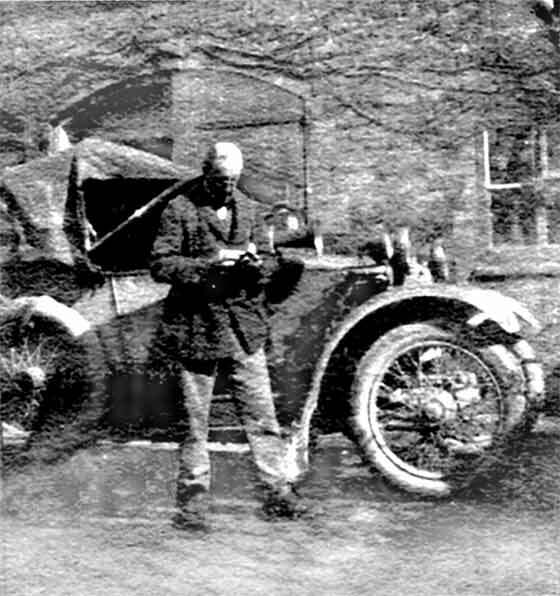 Rather poor grainy photo received from Nigel Barraclough from Southampton (UK) of his grandfather with his car in about 1913/14. His grandfather died in 1918. Identification commenced by cleaning up the photo as little detail could be seen. 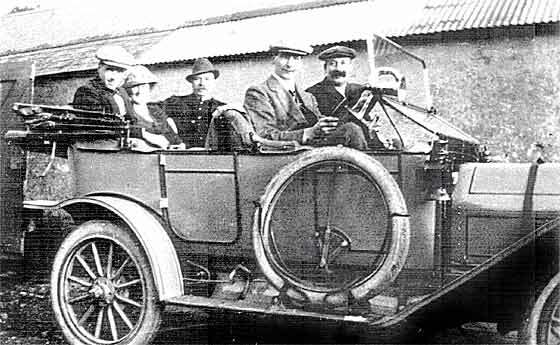 Short bonnet, the hub detail, lamp arrangement and rounded mudguard suggests that this is probably a 1910/13 Lanchester 4 seater with separate hoods for front and back. Lovely photo received from Bill Hibbert (France) who is putting together a book of stereo photographs taken by Jacques Henri Lartigue in the early part of the last century. 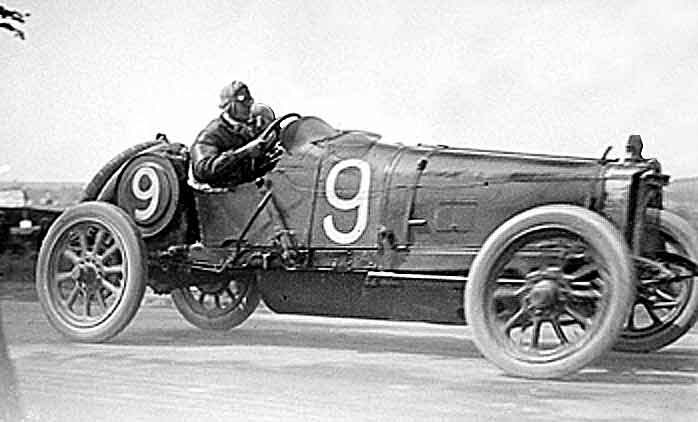 Confirmed by a number of our Members that the photo was taken during the 1913 French Grand Prix showing a Sunbeam driven by Dario Resta which came in sixth. Four cars were entered, driven by Caillois, Resta, Chassagne (came 3rd) and Guinness. Lovely photo received from Tim Ensor of York (UK) believed taken between 1911 and 1919. The car is a Lagonda model 11.1 probably 1914 as it has electric lights. Lagonda was started in Staines Middlesex by an American Wilbur Gunn and named after a creek in his home town of Springfield, Ohio. Lagonda made most classic of British sports cars, some designed by W O Bentley. Lagonda became part of Aston Martin. 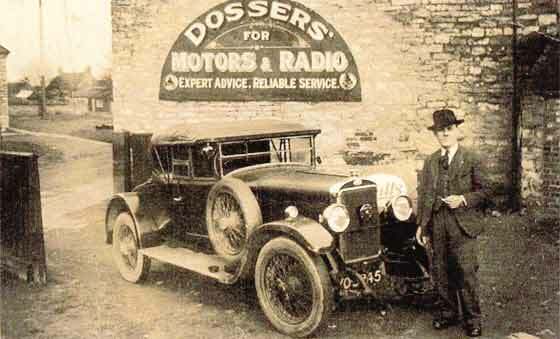 Enquiry from Jane Bonin (UK) researching the history of the Dossor/Dosser family in Yorkshire asking us to date car and photo. Picture taken in Slingsby, Yorkshire showing Fred Dosser, proprietor of the business. We could add that the car was a Sunbeam, probably a 14-40 of approx 1926, registered in London and, judging by the condition of the hood and fashion, was probably photographed in the early thirties. Interesting photo received from Julian Weaver of Brighton, Sussex (UK) taken in the 1930s at Poissy near Paris. 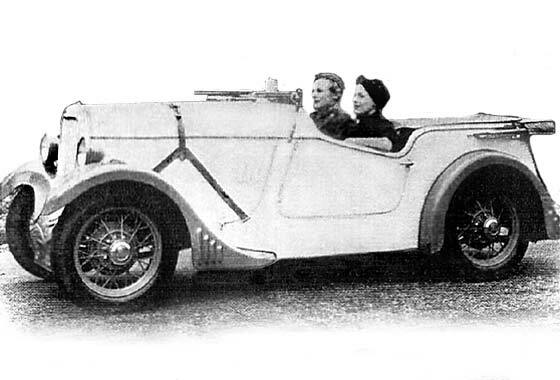 Identified as a Voisin. Airplane style wing supports suggest it could be a C11 (1926-1928). 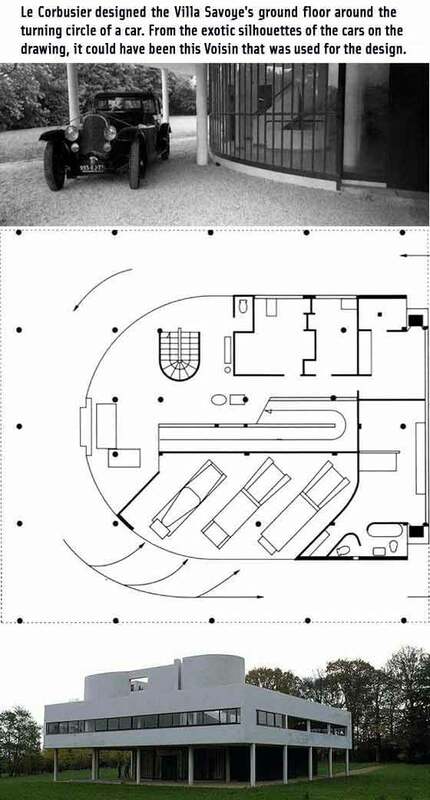 Later contacts provided photos and drawing of Le Corbusier designed Villa Savoye which are worth seeing. Building is radiused to a turning circle of a car which has been suggested as taken from a 1927 Citroen. Request from Jeanette Tonks (UK) for a photograph and information on a 1936 Ford Alpine Tourer 4 seater 2 door body with a 8 HP engine. This type of car was purchased by her sister in 1950 from Rugby Autocar for £175, registration no was OY 810. SVVS Ford 10 expert Tony Russell provided the photo right and lots of other useful information. Alpine bodies were made by at least two companies and in two type models. Fascinating photo received from Mike Hogh of Richmond, Surrey, (UK) taken during a recent holiday in Northern Goa, India. The car was in a garage beside the presbytery, the priest having long since forsaken it in favour of the scooter! The whole car was covered in a remarkably even layer of rust but there was no maker's name, nor indeed any marks at all. 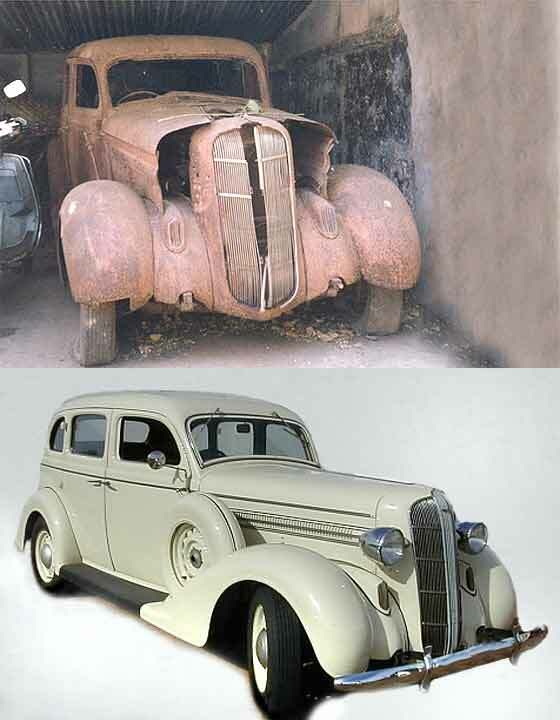 It is in fact a 1936 Dodge Sedan made by the Chrysler Corporation. Photo received from Shirley Reushle of Queensland (Australia) who saw this car with a Bradford badge for sale in a yard in Queensland. 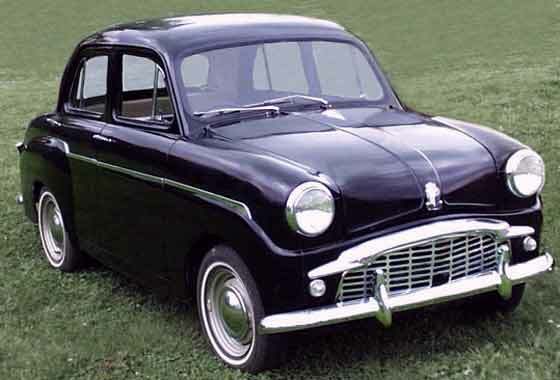 From the appearance of the radiator grille, the small headlamps and wheel pattern, we would say that the car in the photo is a home made 2 seat 'special' based on a mid/late forties Jowett Bradford commercial chassis. Bradfords were based on a two cylinder 7HP 1939 Jowett car. 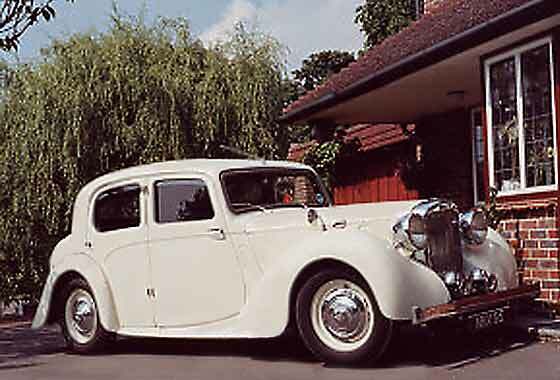 Contacted by Mike Keep of Reigate, Surrey (UK) who has a fully restored 1947 ALVIS TA14 Saloon finished in Old English White which makes it ideal as a wedding car. Only some 3000 of these cars were manufactured between 1946 and 1950. Current values are between £9,500 and £4,500. This one has all the MOT certificates including excellent history file & log book etc. Asking price seems fair at £5,000. Contact from Stuart Brown in the UK who is helping a friend sell his lovely 1929 Ford Model A Phaeton convertible with a 3.3 engine. The vehicle is a Right Hand Drive model. It was fully restored about 4 years ago and is considered to be in mint condition using all original parts. The vehicle is located in Spain and is available for viewing. The asking price is £17,500. If anybody is interested, there or here, please let us know. Series of photos received from Barry Ngai, from Beijing, (China) requesting identification as to the manufacturer, model, and year of production of a car now in Xinjiang, China. Closer identification of the photos confirmed that the car was of Russian origin. It was in fact a car made by "ZIS" (Zavod Imieni Stalina) in Moscow and it was a 1950 Model "110", made between 1945 - 1958 in very much the same form. A couple of emails have been received from Andres who has contacted us from Estonia advising that he has a number of Russian made cars for sale, some part restored and some fully restored. These include GAZ, ZIM, ZIS and UAZ etc. 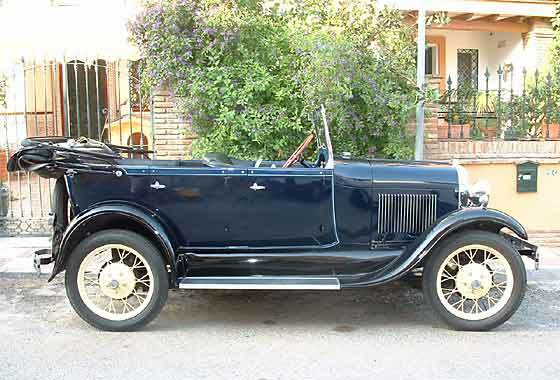 He also has an early Buick and a Dodge, as well as Opel and BMW. Click here to see Photos of some of the Russian cars. He also has some spares available. If interested, please contact direct. Enquiry from James Sellitto (USA) for info on the US Surrey. 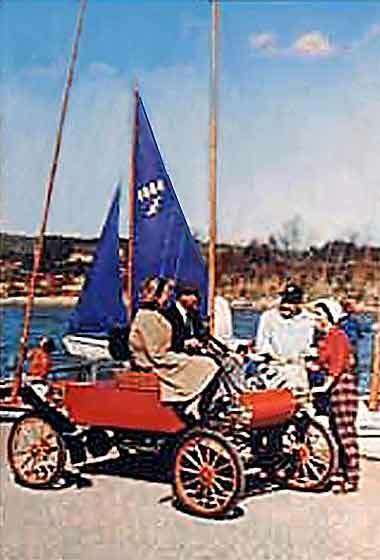 Known as Surrey '03, it was a replica kit car made by E W Bliss Company, Canton, Ohio, between 1958 and 1959. 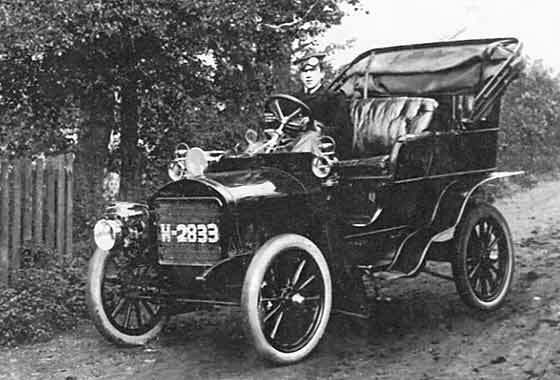 It was based on the 1903 Curved Dash Oldsmobile and fitted with a Cushman scooter engine with current brakes and lighting, available as a kit or could be purchased fully assembled. Only photo I could trace is a miniature publicity photo right. 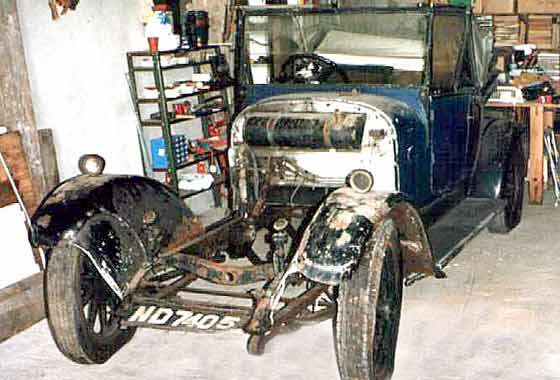 Request for assistance from Chris Gaskell and father (in France) who are about to undertake the rebuild of a 1925 Belsize last running in the 60s. They believe the car was on the Robbialac Paint stand at the 1925 Olympia Motor Show after being passed on as an asset when Belsize went into liquidation. It may have been one of the first applications of cellulose pain. SVVS Belsize owning member Tim Harding is assisting. Friend of David Kuhn (USA) has found a 1959 Triumph TR 10 in a barn and asked for info on history/value. Puzzling as TRs were made only up to TR8? Research eventually established that "Triumph TR 10" was a name used only in the USA for the Standard 10, a small family 4 seat saloon with few frills. Zero value barn find, £800 running and £ 1,400 good ($1200 and $2200.) US value: Triumph TR10 1959 1200.00 $US. Contact from Mr Govidan from Bangalore (India) advising his car is for sale and asking for some idea on value. This is a Morris 10 Series M Saloon, made1939-48, Morris' first monocoque. In the UK the prices are about £4,500 in excellent condition, £3,000 in good condition and £1,500 in poor condition. Not likely to be commercial to import a car from India. If anybody is interested, there or here, please let us know. Contact from Mr. Niluksan (Sri Lanka) searching for more information on Austin 12/4s. His father has a one-owner one and they are about to refurbish it. The engine was rebuilt a few years ago with a new crank and runs with that proper 12/4 sound. The car is going to have a respray and then they will start on the interior. Work is being done with a 1947 instruction manual. They also have a Morris 8 and Morris Minor. Enquiry from Arie Steenkamp (South Africa) who has a derelict late thirties Armstrong Siddeley. 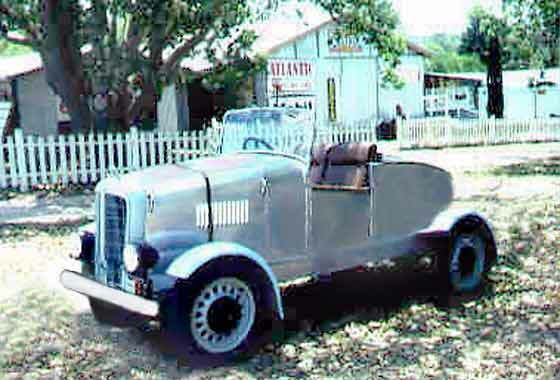 Having provided Body, Batch, Chassis and Engine numbers this enabled SVVS Armstrong expert Simon Pearce to identify it as a Model 17 (lengthened 15) manufactured on 13th December 1934 and fitted with a Burlington coachbuilt body painted two tone green and delivered to client ASM Cape Town, similar to right. Interesting photos received from Byron Jones from Bristol (UK) of a Car Trunk he has had for the last 30 years and wondered if we could help to establish what sort of vehicle it was designed for. It has been kept in his music room so it is in very good condition. The small brass label says 'BREXTON. Registered Trade Mark'. He may consider selling, if asked. It has not yet been identified, so help would be appreciated. 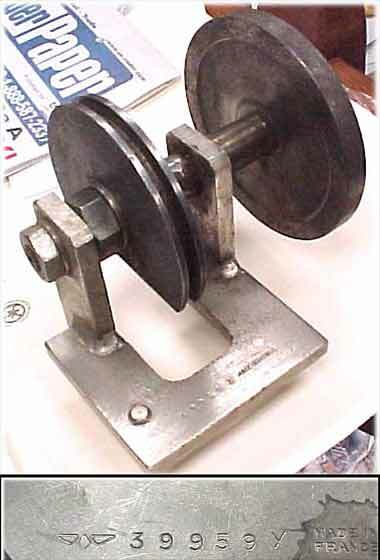 Two photos received from Dan Phenicie Tipton, Indiana (USA) showing a tool which was manufactured in France. The part number on the main unit appears to be 399655N There is another plate for it, which appears to be part number 39959Y. A logo beside the number looks like a diamond with wings on it. The request was for identification and dating. To see picture full size, click here. Dan has a 1932 Chrysler Imperial CL. 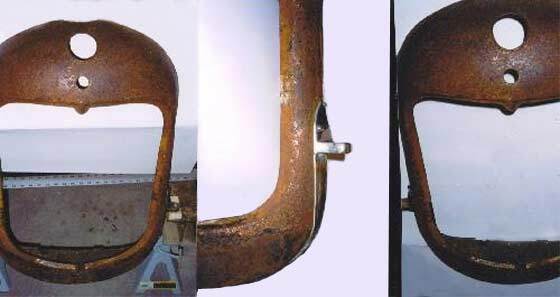 Interesting photos received from Rex Rogers (USA) of a rad surround believed not American, perhaps Citroen? Citroen it is not, but our experts are baffled. Many '20s cars had rounded cowls but few had the small ' V ' below where the badge would be; a recess for a central division bar? Suggestions: early racers Maserati, Diatto, Alfa, FIAT. My guess, possibly a late 20s Auburn. Any suggestions would be welcome.